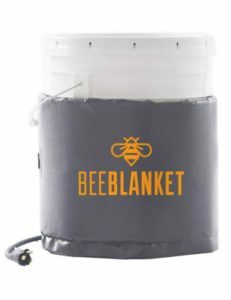 Powerblanket | The Total Temperature Control Blog | Why Does Honey Crystallize? Simply melting it in the microwave every time will NOT solve the problem. Crystalizing is what honey DOES over time as it is stored. Solution: Warm your chunky honey to about 130 degrees until completely fluid, no crystals! Then whip in 10% “creamed” honey, available at most grocers. Creamed honey has crystals, too, but they are microscopically small, and add a smooth, buttery texture to the honey, rather than chunky crystals. After you have beaten the creamed honey thoroughly with your melted honey, the microscopic crystals will “seed” your formerly chunky honey with the microscopic crystals. Set it in a cool room for a few days, and the whole batch will become smooth and buttery like the creamed honey you seeded it with. It should remain in that state permanently, unless you melt it again, or add other crystallized honey to it. See a video of the process on Instructables.com Creamed Honey DIY. Never put in microwave—it kills the good bacteria. Heat a pot of water, put honey in a glass jar and heat until crystals dissolve.